We live hearing news of T-Mobile’s LTE network growing, and often it’s a case of users picking up tasty high-speed connections on their mobiles before T-Mo officially announces it, or updates its list of covered areas. Using SpeedTest.net’s app, they pulled in some pretty speedy download results. 20.70Mbps down and 7.5Mbps uplink is nothing to be sniffed at (Unless you’re from Dallas…). Second spotting was in Lexington, South Carolina. So there you have it. Yet further evidence that T-Mobile is making good on its promise to roll out 4G to as many people as possible before the year’s up. If you live in an area where 4G has just gone live, we’d love to hear from you. Especially if you’ve only been getting 2G. Throughout this year, T-Mo will be replacing its 2G/Edge network with LTE in a number of cities. If you’re in one of those, and LTE lights up, shoot me an email: cam@tmonews.com. Ah man, that’s my neighbor to the south, hoping they edge there way on up to North Carolina…we’re ready for some more LTE lovin’!! You can also add West Columbia, SC to that list too, I have been experiencing LTE there around the Time Warner offices, and also Oak Drive and U.S 1. Add to that it’s full bars around Best Buy off Sunset Blvd in Lexington SC too. Yeah. I mapped sunset Blvd last night with Sensorly. 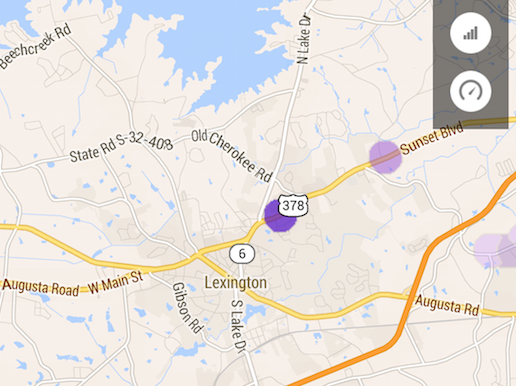 Lexington isn’t completed yet with lte. I’m also picking it up near Radius Church on Main St, as well as around LMC Lexington. Statesville, NC, Hickory, NC, and Burlington/Graham, NC are all LTE now. Ah man, thats awesome news…i’m in Mocksville…no LTE yet! I second this a million times over :). Foley Alabama. Its 2G on the coverage map, LTE in reality. My buddy lives there and said it just happened the other day. The coverage map on T-Mobiles website is from June 18, 2013. Scroll down under the map and click “Learn more” In the map information section. the network switching from LTE to HSPA is a problem in many cases. When I receive a call, it switches to HSPA immediately but when I drive around to the outskirts of town, suddenly I find no signal and after about a minute or two, in the same area, I get HSPA signal. I think this causes many people to believe that there are too many dead spots with t-mobile. T-Mobile has not launched VoLTE. So all voice calls are handled over UMTS (simultaneous voice and data) or GSM. The same thing happens on AT&T. On Sprint and Verizon, they fall back to CDMA voice. they just launched VoLTE in Seattle…so that gives us something to look forward to. WTF is your point ? When I had at&t, it smoothly transitioned from LTE to HSPA as available. Why can’t t-mobile do the same ? Who gives a $h1t about VOLTE ? no, it won’t. you have NO idea what I am saying. Still 2G in NEW Holland, PA . Still EDGE only in the Bristol, TN/VA area and only a limited HSPA+ network in Kingsport,TN and Johnson City,TN. I really hope T-Mobile get’s to working on LTE in my area and of course gets rid of all the EDGE around here especially since Verizon, AT&T, and even Sprint have solid LTE coverage in the area! I live in Newark, OH, 30 miles east of Columbus, which has really fast LTE. 30 miles east of us is Zanesville. They have LTE, but in between is only 2G. I was told by an employee in a T-Mobile store when I upgraded to my Galaxy S5 that Newark would be getting 3 new towers and LTE either 4Q this year or 1Q next. I’m genuinely surprised that Cabo Rojo PR has it, since well… it’s a beautiful place, but not exactly a hotbed of anything other than being a beautiful place. Still 2G in mid to southern Delaware. Waiting patiently! I was just in Smyrna, and was dismayed to see it stricken with 2G. As is the case in Middletown. DE is a forgotten state. Ready to see some LTE start covering the remaining EDGE areas of NC, especially the eastern part. Statesville, NC is live now though. is it all of statesville or is it mostly where walmart, and all the eateries are? I’m not exactly sure myself as I haven’t driven up there since T-Mobile’s EDGE to LTE announcement. I just saw some users mapping via Sensorly where they were picking up LTE. On the map it looked like I-77 was covered and US 70 and well as downtown.